In Saintfield, go straight down the main street to the traffic light controlled crossroads. Go straight on (signposted Killyleagh and Killinchy). Approximately 2 miles out of Saintfield there is a "Y" junction. Stay on the road, bearing round to the right, signposted towards Killyleagh. Keep on this road (the B6) and go straight through Darragh Cross and Raffrey until you come to Derryboy crossroads. (Five road ends) Turn left at the crossroads (into Derryboy Road). Go along the road for 1.4 miles and you will come to a small crossroads. Clay Road is to the right. Turn right into Clay Road. Ringfort Stud is 0.7 miles along Clay Road on the left. The entrance is a distinctive arch with 171 on the right hand side. 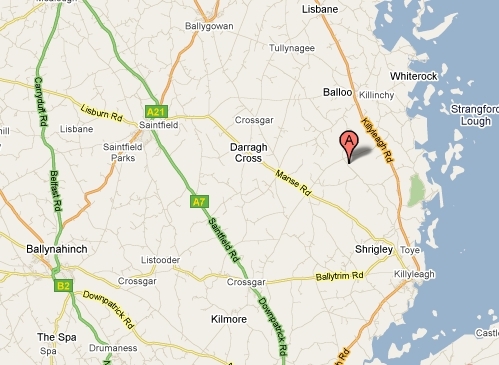 Go to Ballygowan (out the Ballygowan Road which will take you past Roselawn Cemetery and the Crematorium). In Ballygowan, take the second exit from the roundabout at the centre of the village (signposted to Killinchy and Killyleagh). Stay on the road towards Killyleagh. Five miles down the road you will come to a T-junction, at Raffrey. Turn left (on to the B6, towards Killyleagh). Less than a mile down the road is the Derryboy crossroads. (Five road ends.) Turn left at the crossroads (into Derryboy Road). Go along the road for 1.4 miles and you will come to a small crossroads. Clay Road is to the right. Turn right into Clay Road. Ringfort Stud is 0.7 miles along Clay Road on the left. The entrance is a distinctive arch with 171 on the right hand side. From roundabout (Exit 6) take road (A49) to Saintfield; approximately three miles before you reach Saintfield, you come to Temple (staggered crossroads) - go straight on, following the signs to Saintfield. In Saintfield, go straight down the main street to the traffic light controlled crossroads. Go straight on (signposted to Killyleagh and Killinchy). Approximately 2 miles out of Saintfield there is a "Y" junction. Stay on the road, bearing round to the right, signposted towards Killyleagh. Keep on this road (the B6) and go straight through Darragh Cross and Raffrey until you come to the Derryboy crossroads. (Five road ends). Turn left at the crossroads (into Derryboy Road). Go along the road for 1.4 miles and you will come to a small crossroads. Clay Road is to the right. Turn right into Clay Road. Ringfort Stud is 0.7 miles along Clay Road on the left. The entrance is a distinctive arch with 171 on the right hand side. Go to Comber and take the Killinchy/Killyleagh Road. The small village of Balloo is 6 miles down the road. Go straight through it on the Killyleagh road. Approximately one and a half miles from Balloo, Derryboy Road is to the right (signposted to Derryboy). Turn right and drive for a further one and a half miles approximately and you will come to a small crossroads. Turn left into Clay Road. Ringfort Stud is 0.7 miles along Clay Road on the left. The entrance is a distinctive arch with 171 on the right hand side.